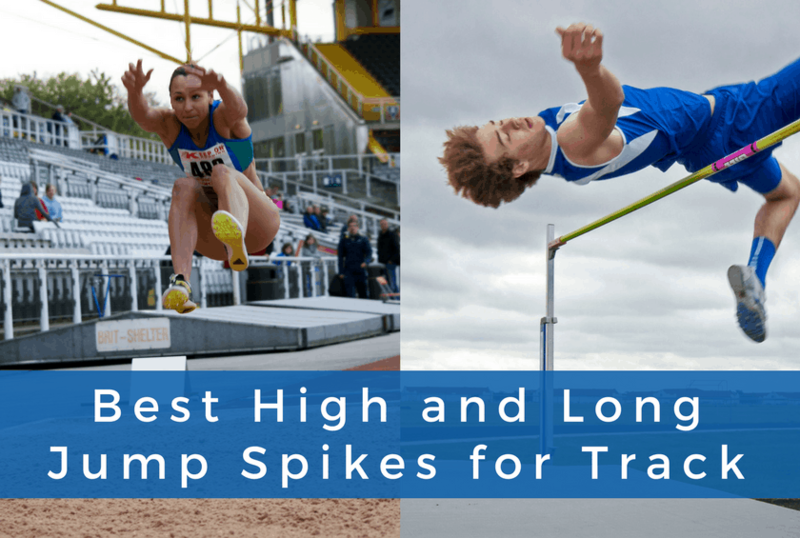 We’ve tested and reviewed the best high jump and long jump spikes available now. 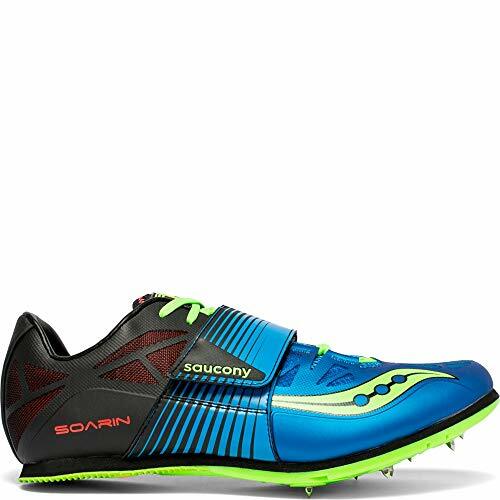 With these spikes, you’ll be soaring to new heights and distances. 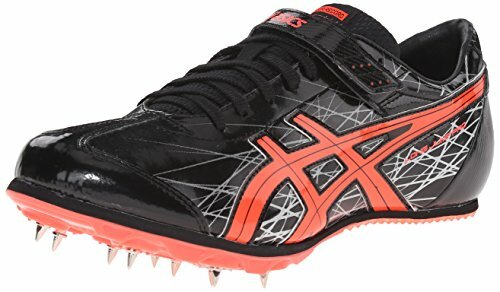 Jumping spikes feature a lightweight design with plenty of traction and a secure fit. The lightweight Uplift HJ2 keeps you locked in, but remains comfortable thanks to Saucony’s ISO lacing technology. The ISO fit on the upper provides a stable, secure fit while allowing your foot to move freely. The overlays on the upper add further stability without compromising on weight. A mid-foot strap across the top of the spike adds additional support to control foot rotation. The outersole features an 11-pin spike plate for traction and customization of the spike placement. The spike plate has a rubber outsole for added traction on various types of track surfaces. You might be wondering why this spike has an “L” in its name. That’s because it’s made specifically for jumpers taking off from their left foot. The asymmetrical spike plate is designed for athletes jumping off from their left foot (the majority of jumpers). A composite rubber covers the spike plate to provide extra traction on different types of track surfaces. The midsole is made from Solyte – a uniquely constructed foam designed to be lightweight and durable with a “just right” amount of cushioning. The upper is made with synthetic leather which resists scuffing and makes cleaning easy. A cross strap along the midfoot adds extra stability to the spike. 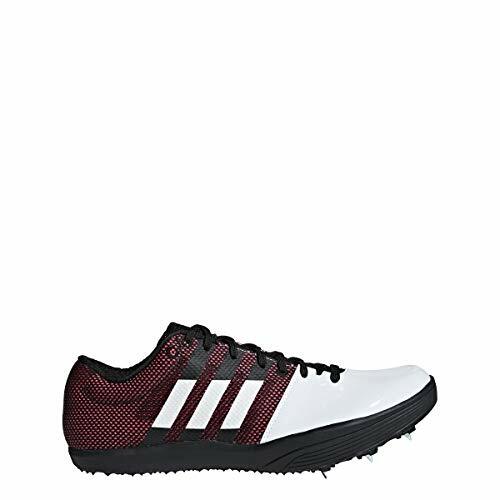 The adizero High Jump spikes are built with the perfect balance of weight, cushioning, and traction. The synthetic upper has a nice fit and can be cleaned easily. The microsuede lining allows the foot to sit comfortably inside the shoe while resisting blisters and hot spots. A midfoot strap adds extra support to the spike. The 11-spike spike plate is durable and lightweight. It’s covered in a crisscross rubber pattern for additional traction. Finally, the lightweight foam midsole provides just enough cushioning and support to the rest of the spike. The Soarin J2 jumping spike has a great feel on the upper combined with excellent traction to propel you to the takeoff board. The ISO fit upper provides a form-fitting, secure fit that adapts to your foot. But it has enough flexibility to remain comfortable, letting your foot move freely. A wide, midfoot strap further secures your foot. The 8-pin spike plate is rigid allowing for a solid takeoff for the long jump, triple jump, and pole vault. The Soarin J2 also has an EVA midsole for the right mix of cushioning and support. The Long Jump Pro is built to provide maximum speed as you accelerate while propelling you after take-off. The 9-spike plate remains rigid at the spike locations, but has some flexibility in the back for improved energy return at take-off. 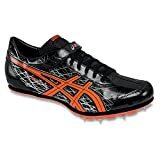 The outsole also has Asics’ SharkDuo rubber compound for increased traction. The synthetic leather upper resists scratching. A midfoot strap enhances the fit. And the midsole is made of a foam called Solyte that remains lightweight but cushion-y with just the right amount of support. 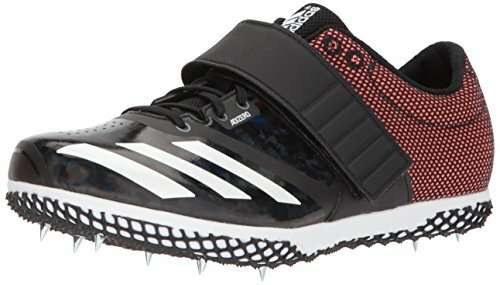 The adizero Long Jump spikes have a synthetic leather upper for a fine-tuned fit along with a rigid spike plate for traction. The 7-pin spike plate combined with the crisscross rubber Sharkskin outsole provides great traction for a variety of surfaces. The spike plate is lightweight but rigid. The synthetic leather upper fits well and stays clean. The sock liner is made of microsuede for a comfortable fit. And the midsole foam provides a nice combo of cushioning and firmness. What’s the difference between jumping spikes and running spikes? Both high jump spikes and long jump spikes have a more substantial spike plate than most running spikes. They have more pins to screw in spikes. And they have an extra layer of rubber to increase traction. 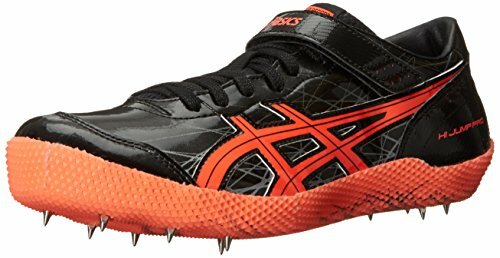 High jump spikes also have an extra set of spikes in the heel. This is due to the foot placement on take-off – you want a firm, secure landing spot before you jump. High and long jump spikes also have a midfoot strap across the top. This adds an extra level of support and a secure fit, crucial for jumping events where your feet put pressure on all parts of the spike. What if I also do running events? 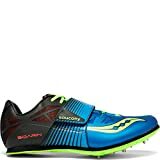 Do I need a different set of spikes? This depends on how serious you are about your events. In an ideal world, it’s great to have specialized spikes for each event. But since many spikes cost $100 or more, this isn’t always an option. 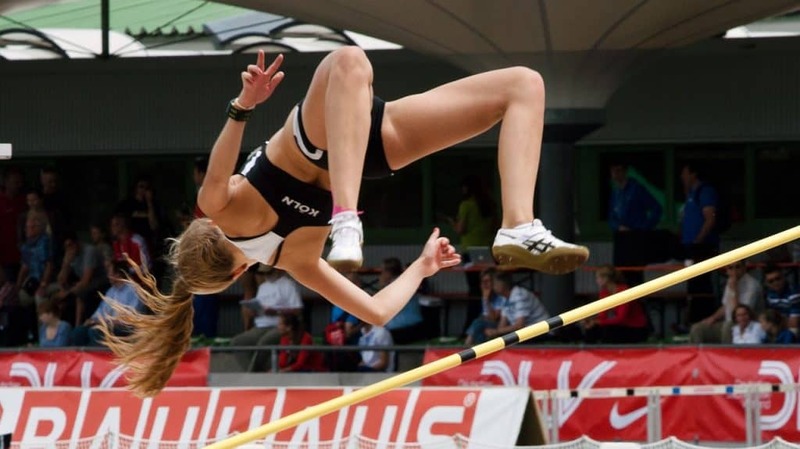 If you primarily do sprinting, long jump, and pole vault, a sprint spike will work fine for those events. 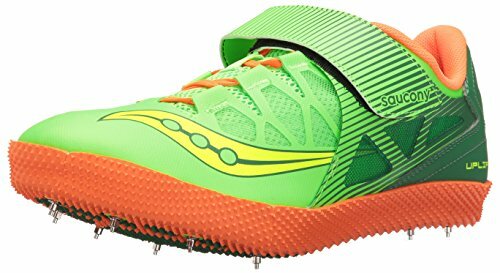 For a more multi-purpose spike, mid-distance spikes are usually best for a wide variety of events. What shoe size should I order for unisex sizing? All of the best jumping spikes are unisex. They are listed in men’s sizes. To figure out women’s sizes, size down 1.5 sizes (so if you are a women’s size 8, order a size 7.5). How should jumping spikes fit? You want a tight and secure fit. Your toes should be close to the front of the shoe but shouldn’t feel cramped or pinched. Most people often go a 1/2 size down from trainers.